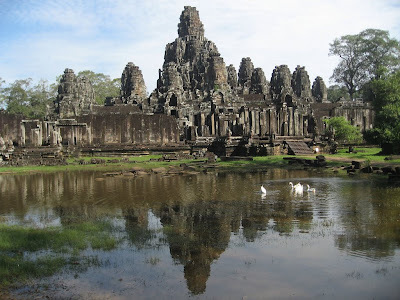 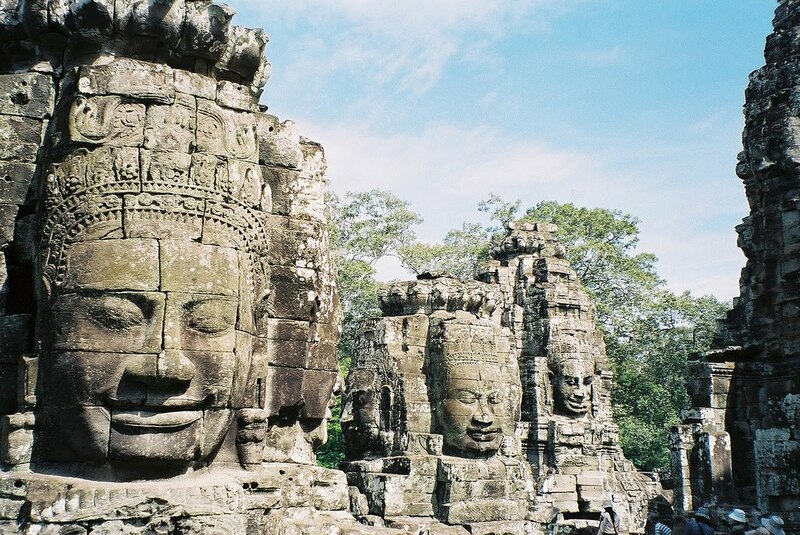 Angkor Thom means "The Great City". 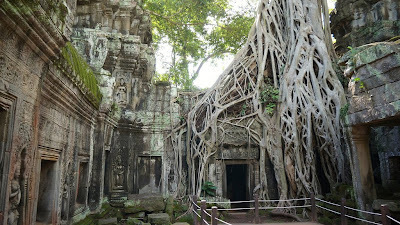 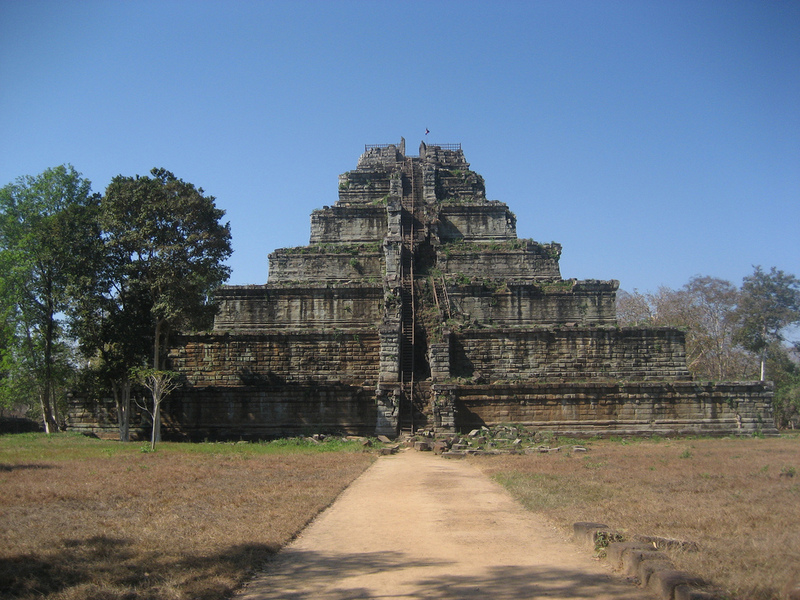 It was established in the late twelfth century by king Jayavarman VII and the last and most enduring capital city of the Khmer empire. 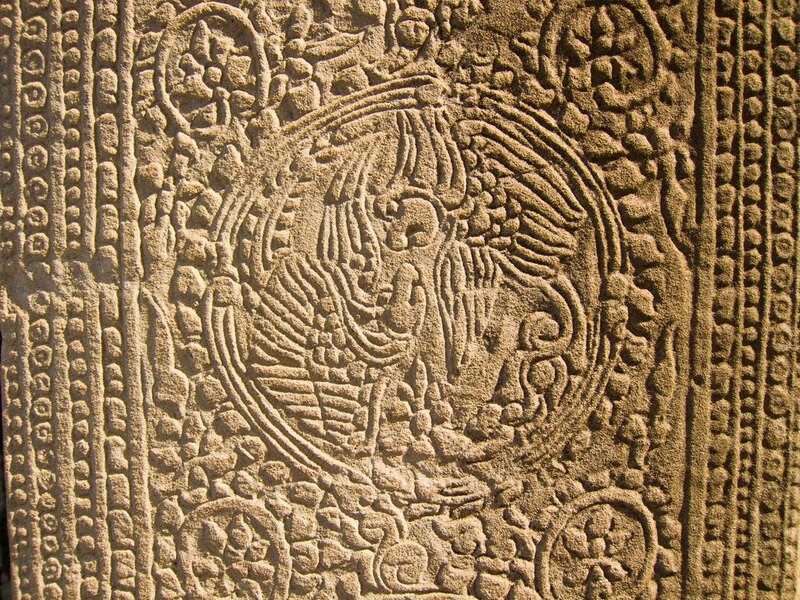 The earlier city Yasodharapura was centred further northwest. 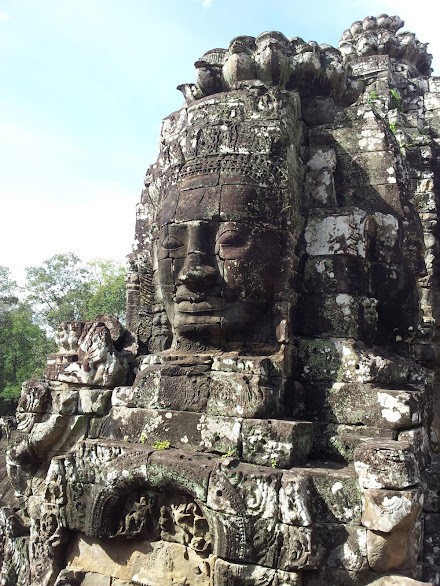 Angkor Thom overlapped parts of it. 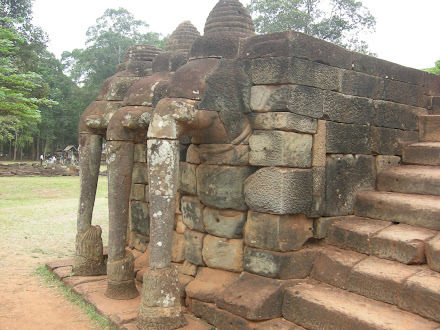 So the former state temple of Baphuon got part of Angkor Thom. 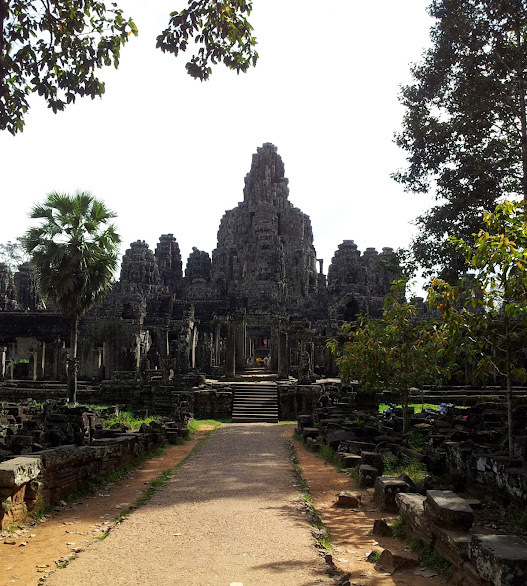 The roads lead to the temple of Bayon in the centre. Prasat Bayon was built in the late 12th century or early 13th century as the official state temple of the Buddhist King Jayavarman VII (1181-1218). 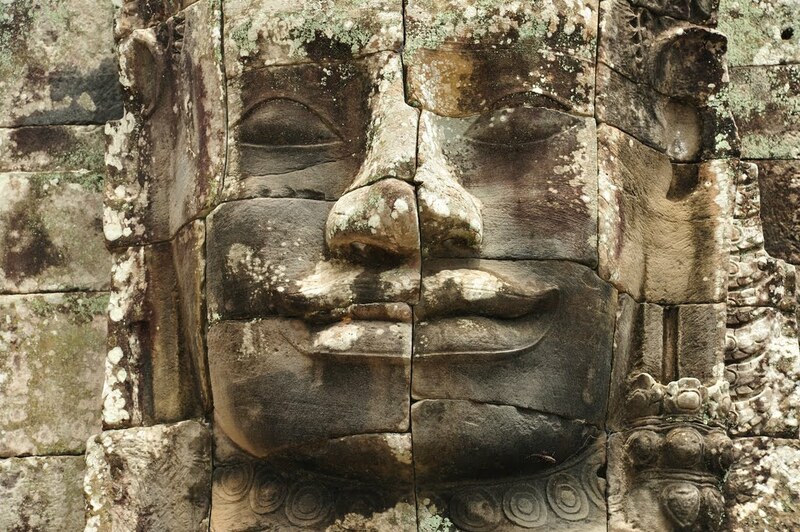 After his death it was modified and augmented by later Hindu and Buddhist kings. 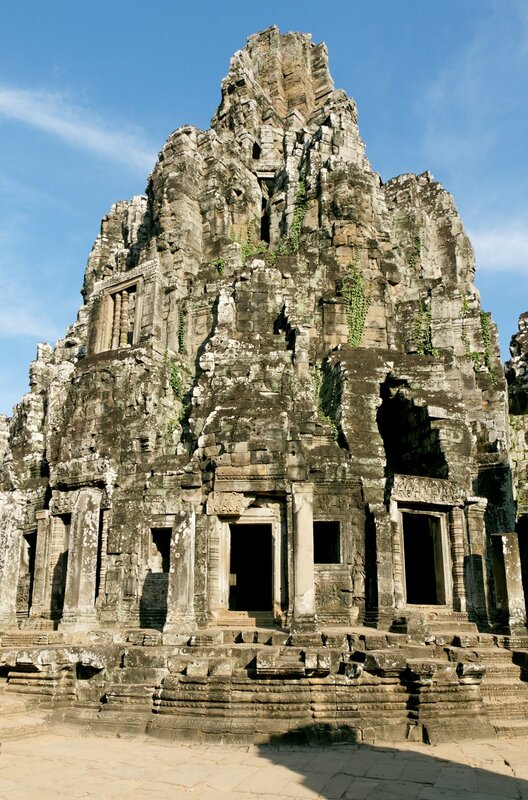 Bayon is famous for the 216 serene and massive stone faces on the many towers which cluster around its central peak, symbolizing Mount Meru. 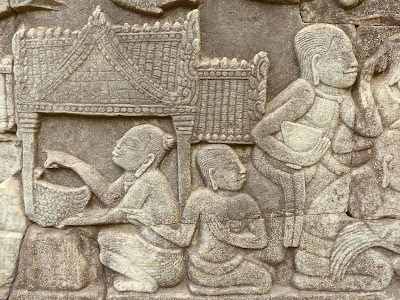 On the outer wall of the outer gallery you see a series of bas-reliefs depicting historical events and scenes from the everyday life of the Khmer. The outer gallery encloses a courtyard with two libraries. 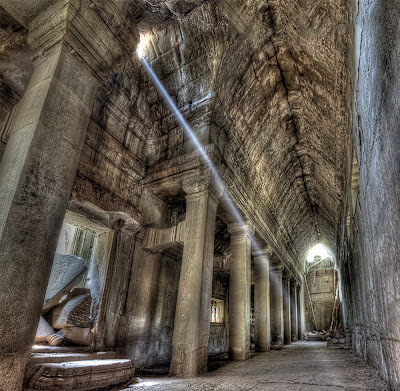 The inner gallery is raised above ground level. 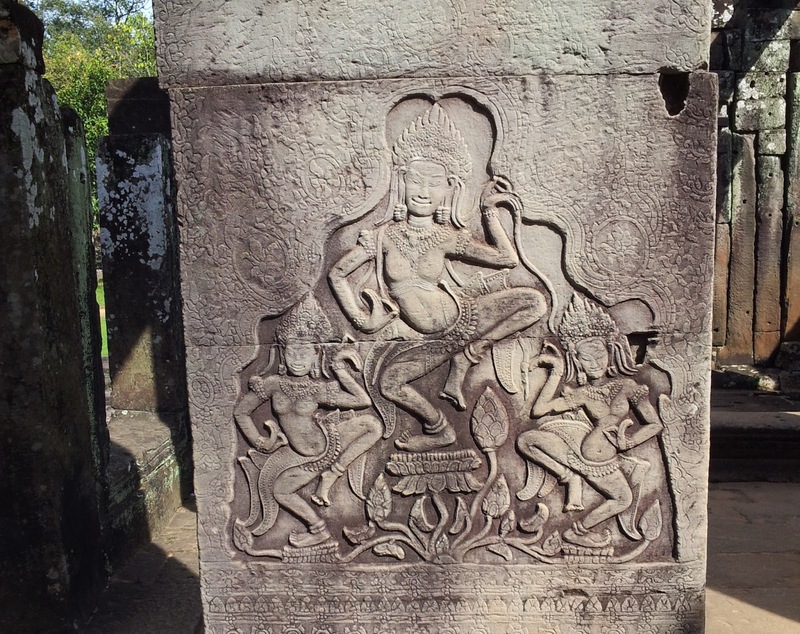 Its bas-reliefs show scenes from Hindu mythology. You discover Siva, Vishnu, and Brahma, the members of the trimurti or threefold godhead of Hinduism, Apsaras or celestial dancers, Ravana and Garuda. The upper terrace is home to the famous face towers. 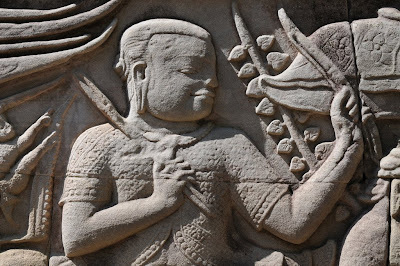 On the outer wall of the outer gallery you find a series of bas-reliefs depicting historical events and scenes from the everyday life of the Angkorian Khmer. 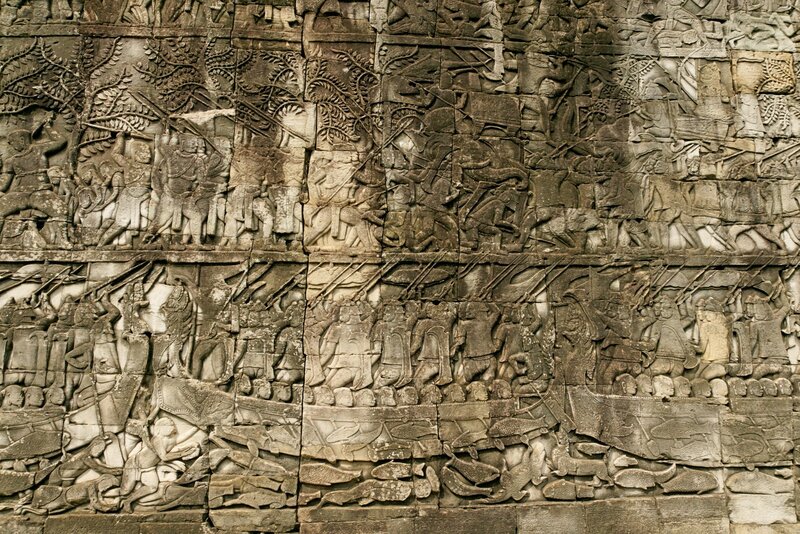 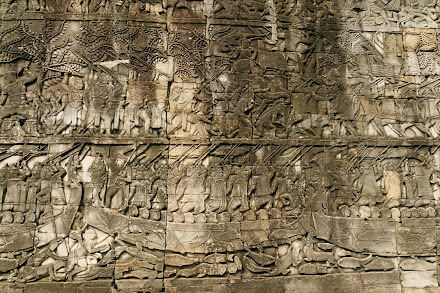 Bas-reliefs on the outer wall of the 3rd enclosure, here showing a naval battle on the Tonle Sap between Khmer and Cham forces (in the eastern part of the southern gallery). 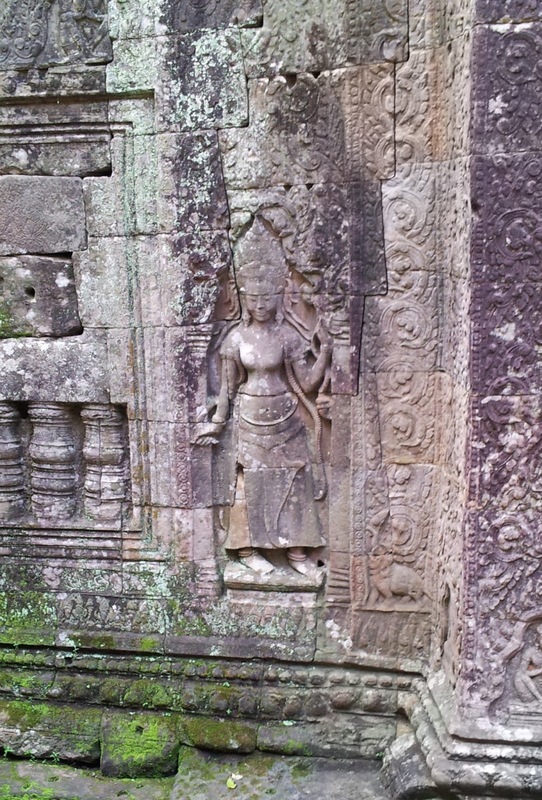 Moving on in Prasat Bayon you will encounter a lot of female energy: Everywhere you see devatas. Robert McCarthy is now cataloging the 377 devatas at the Bayon. 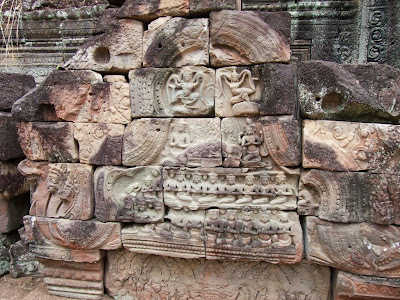 Peter Sharrock from the School of Oriental and African Studies, estimates that the original Bayon structure displayed 6,250 celestial dancers. 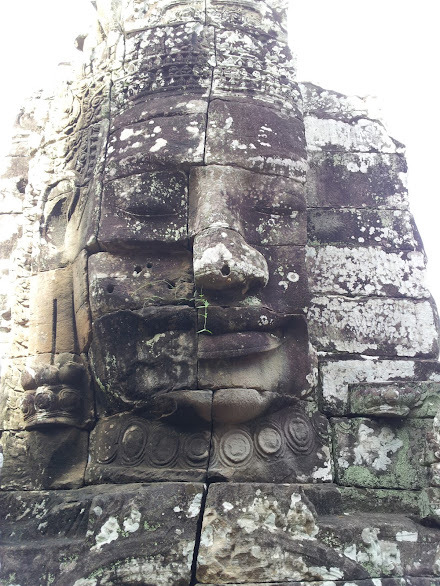 Read his chapter “The mystery of the face towers" in the book Bayon: New Perspectives. This book brings together leading experts and their findings and insights about Bayon's art, architecture and inscriptions. 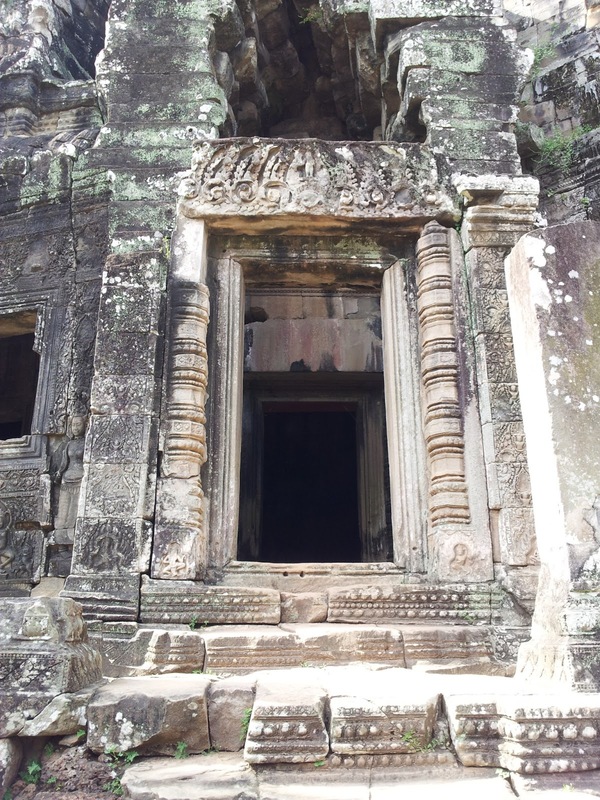 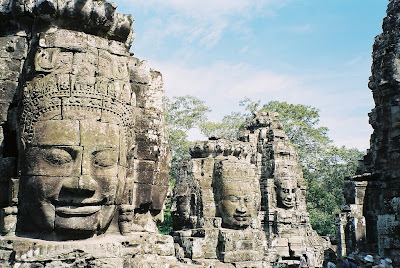 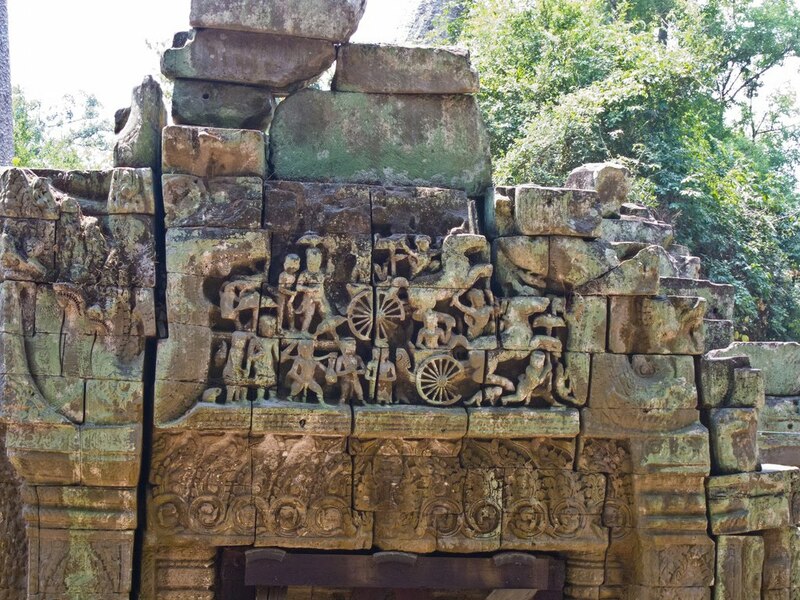 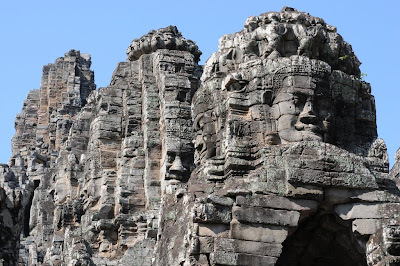 Sharrock has new answers to one of the big questions about Bayon: Who are the guys on the face towers? Many experts have said that they depict the Mahayana deity Lokesvara. 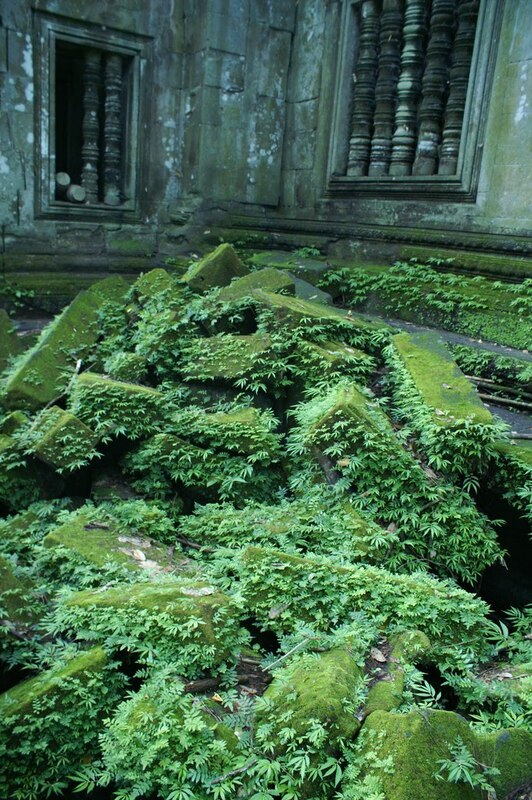 But Sharrock has a different idea. 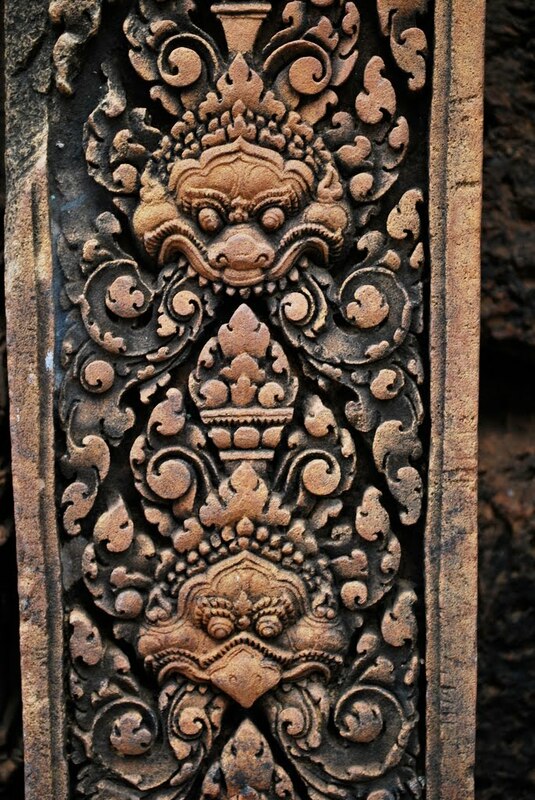 He sees Tantric influence. 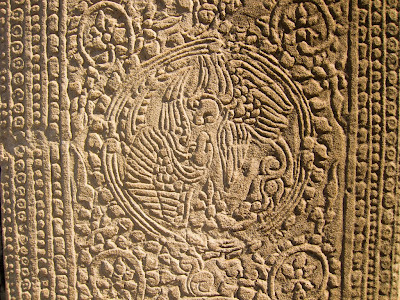 Tantrism flourished in northern India in the Middle Ages. 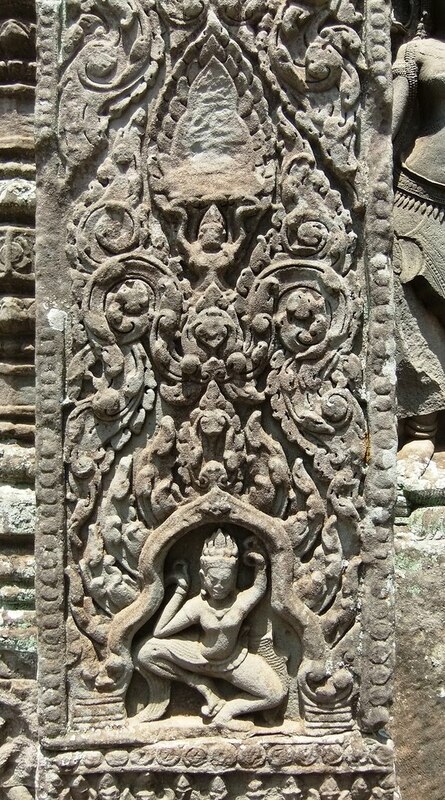 Sharrock thinks that the face towers depict a tantric deity called Vajrasattva. 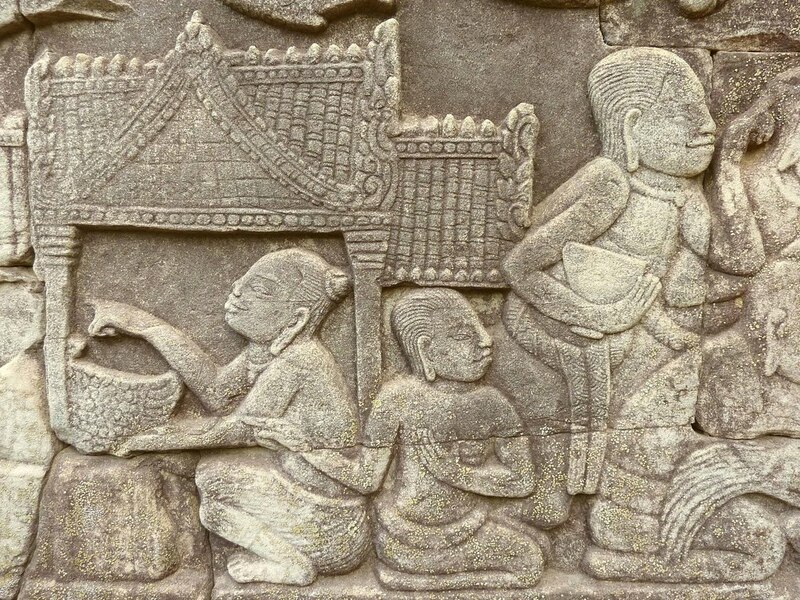 Read more on World Cultures From New Perspectives. 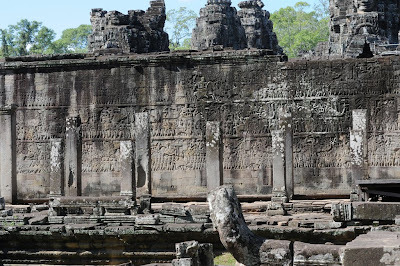 The 350 meters long Terrace of the Elephants was used by king Jayavarman VII as a platform from which to view public ceremonies and it was the base for his audience hall. 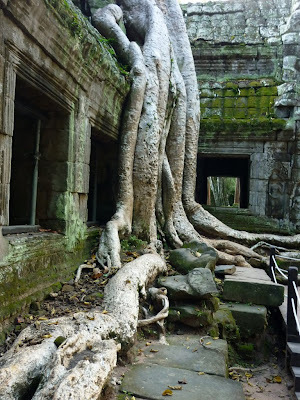 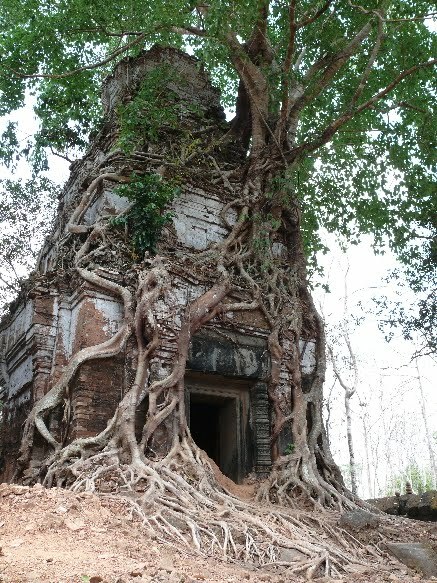 It was attached to the palace of Phimeanakas, of which only a few ruins remain. 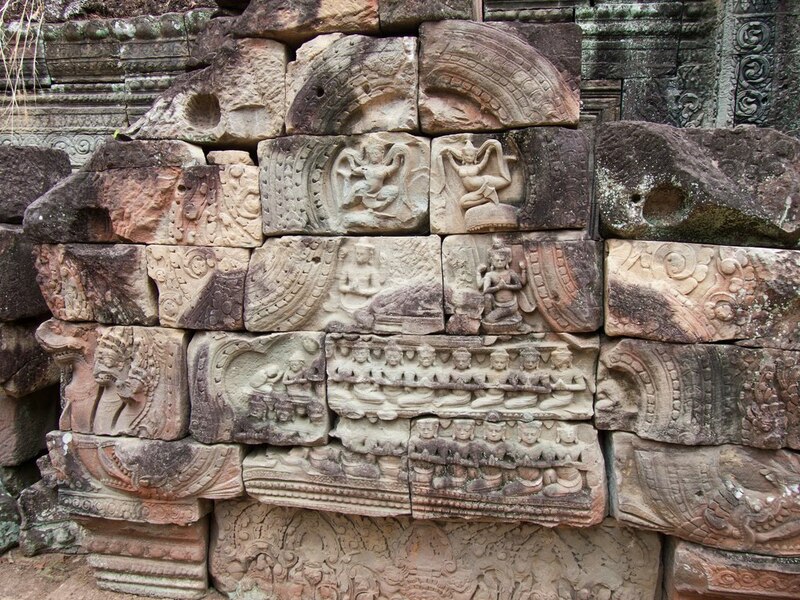 The middle section of the wall is decorated with life size garuda and lions; towards either end you see elephants with their Khmer mahouts. 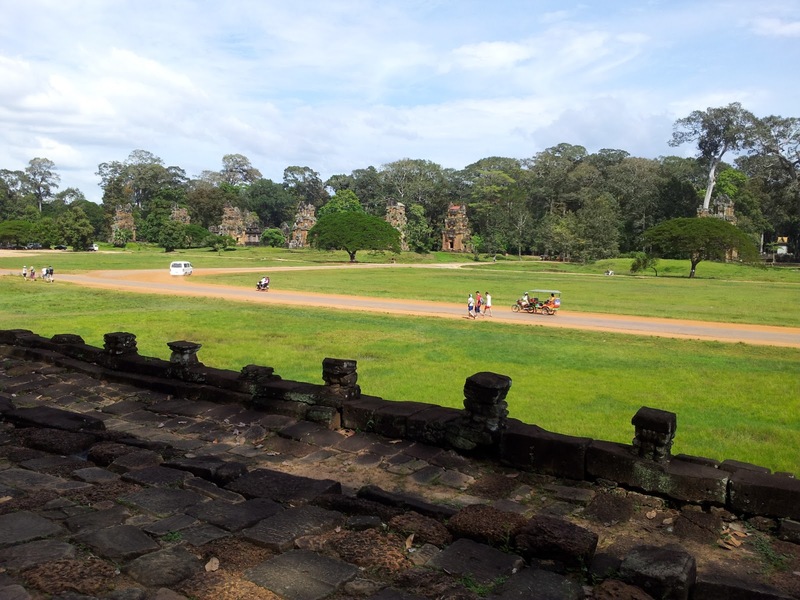 From the Terrace of the Elephants you see some of the twelve towers of Prasat Suor Prat. According to a Cambodian legend, the towers served as anchoring places for ropes which stretched from one to another for acrobats performing at festivals. 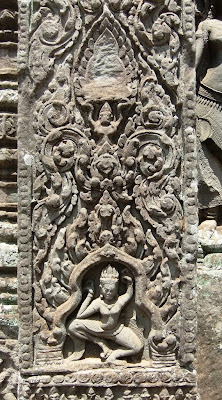 See also this gallery of photos. A 10th century temple dedicated to the Hindu god Shiva. 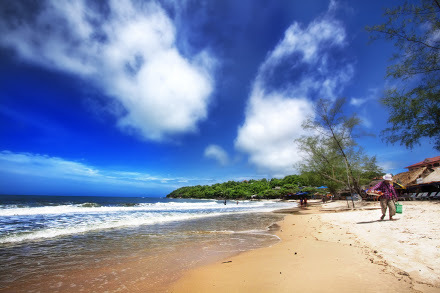 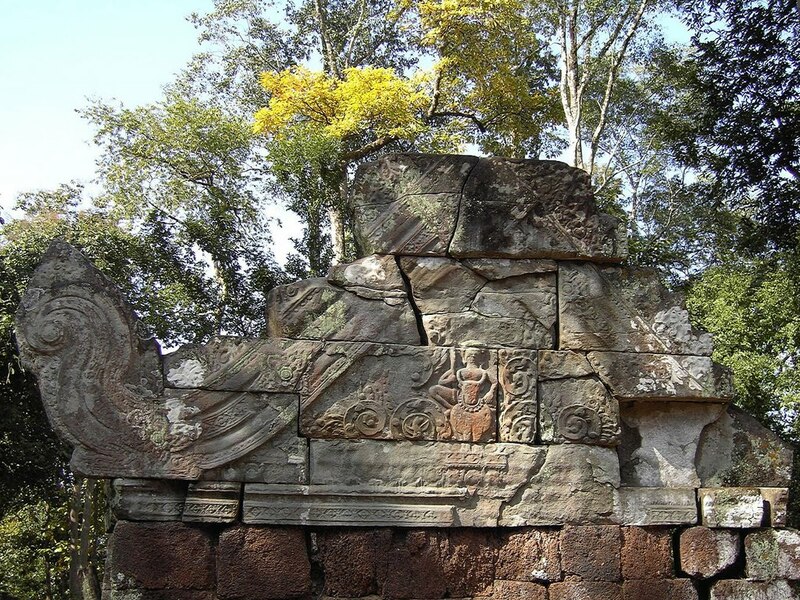 It lies near the hill of Phnom Dei, 25 km north-east of Angkor Thom. 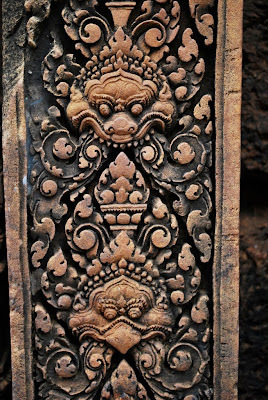 Banteay Srei is built largely of red sandstone. 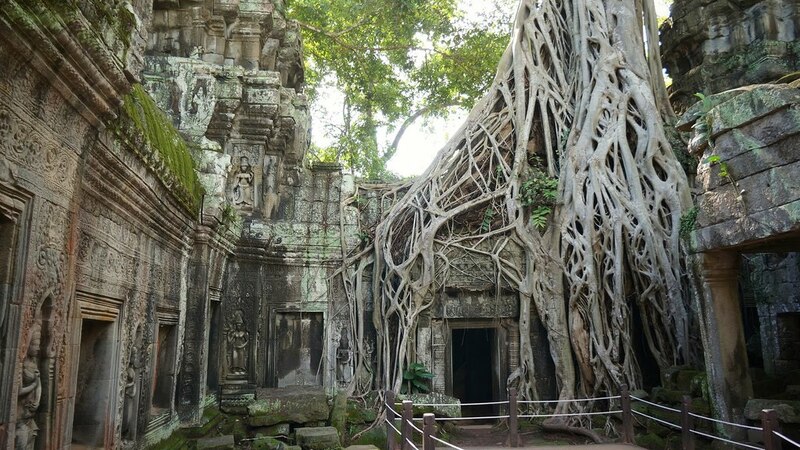 The Khmer empires capital was located in the Angkor area for 500 years. 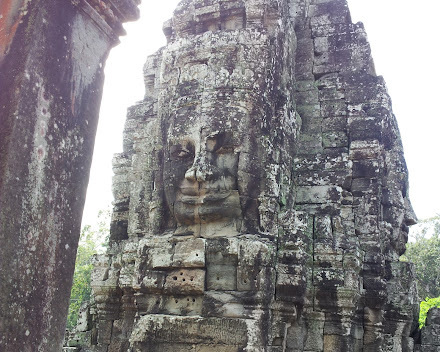 But there was one short interruption: In 928 A.D king Jayavarman IV created a rival capital in Koh Ker - 150 kilometers from todays Siem Reap. 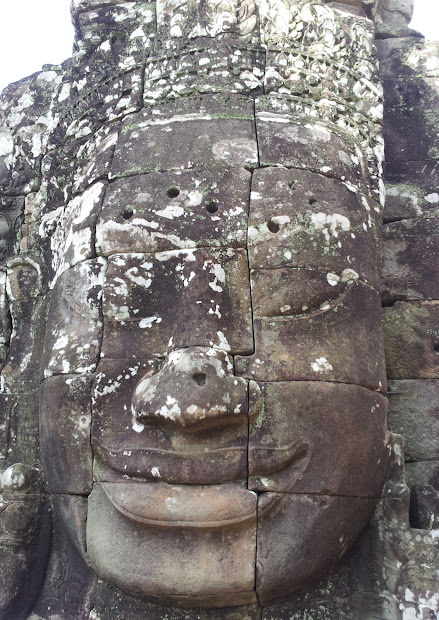 One way takes 2.5 hours. 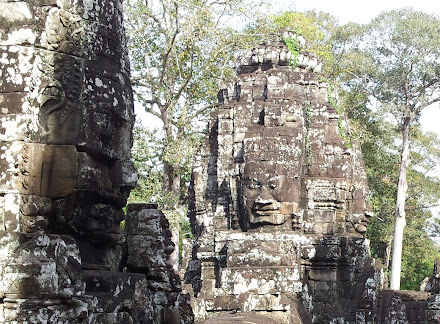 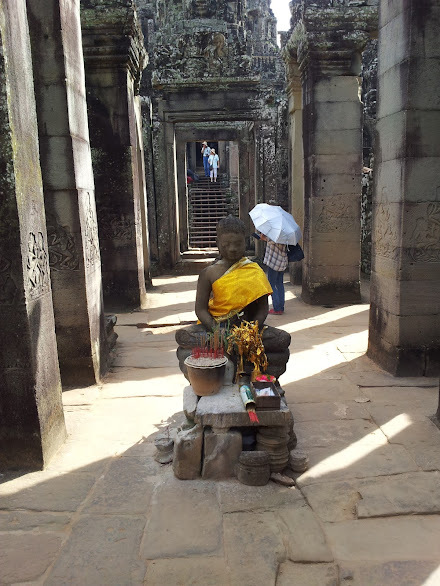 The empire was ruled from here for 23 years until his son Hashavarman II returned it to the Angkor area. 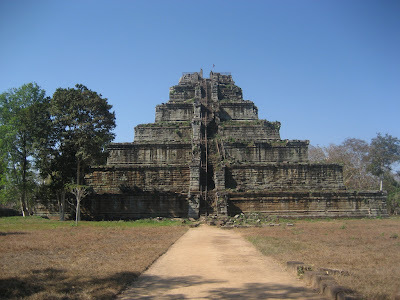 The most impressive ruin is Prasat Thom (Big Temple), a 7tiere pyramid. The temple stood on an artificial island at the center of the now dry East Baray reservoir. South of the East Baray. 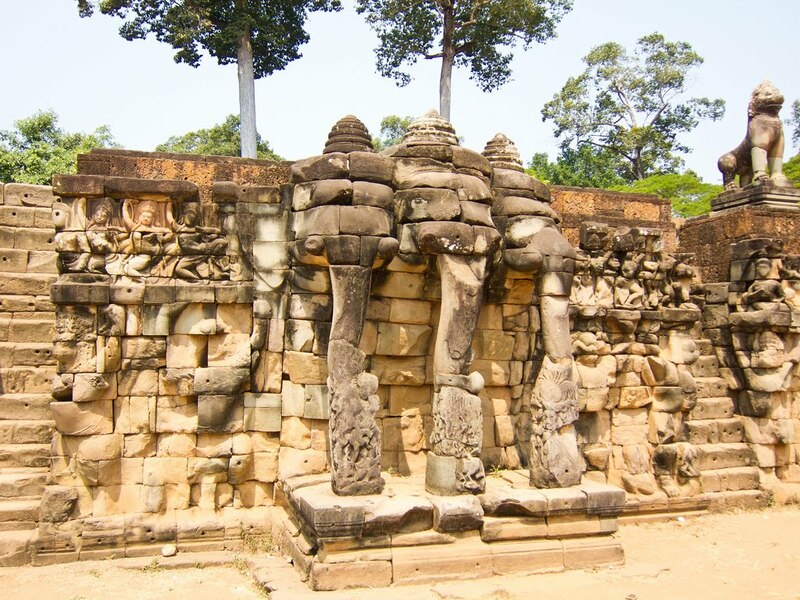 Pre Rup is aligned on a north-south axis with East Mebon. Northeast of Angkor Thom. See pictures by foonie. A legal battle in the US over the fate of a 10th-century Khmer statue has heated up, with federal prosecutors accusing the international auction house Sotheby’s of lying about its provenance in an effort to sell it for millions of dollars. 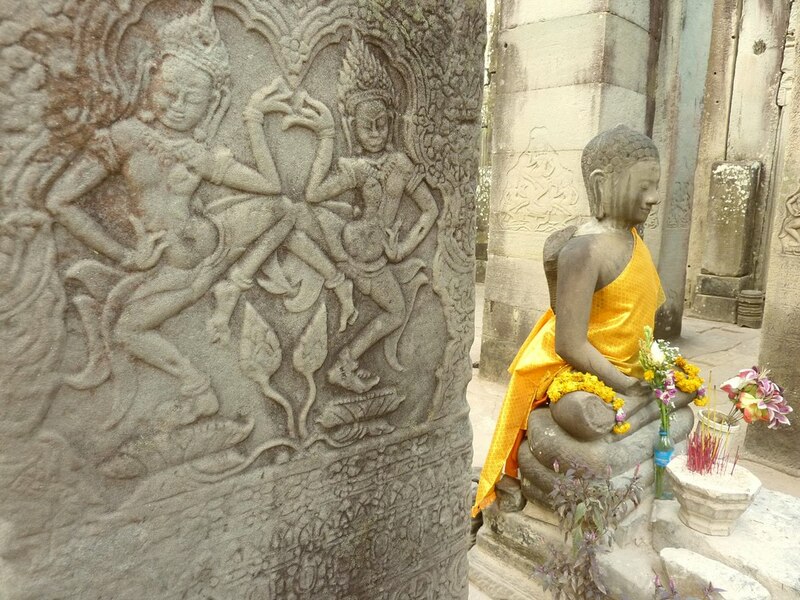 They claim that both Sotheby’s and the statue’s owner knew the statue had been stolen from the Koh Ker temple complex in the early 1970s. 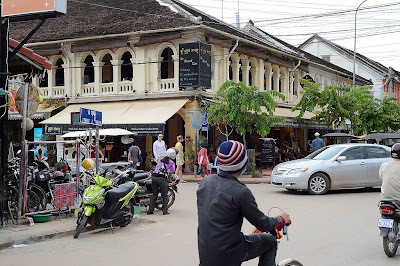 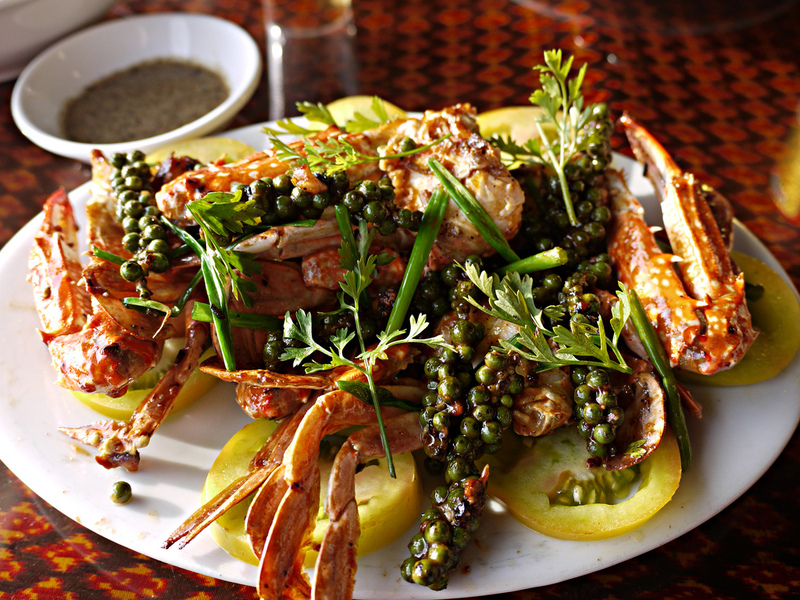 Read on phnompenhpost.com. 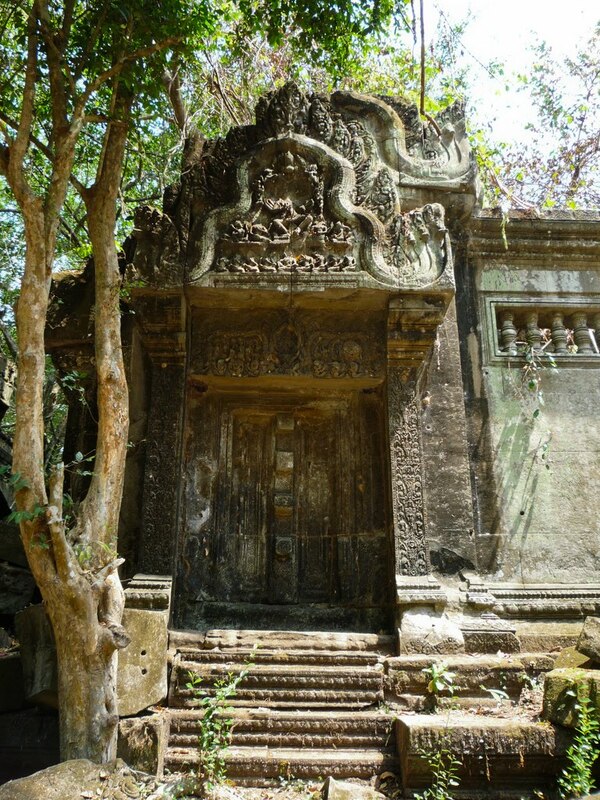 Cambodia's Undiscovered Temples on cntraveler.com about Phnom Da, Angkor Borei and Phnom Bayong.